As more and more iPhone apps sync with desktop counterparts, a particular dilemma has become more and more common: What if your Mac is asleep when you want to sync? For example, I use the excellent Things for iPhone ( ) and Things for Mac ( ) to keep on top of my tasks and projects, and when I’m using the iPhone version—in other words, when I’m away from my desk—my Mac is often sleeping. Wake on Oui is one of several iPhone apps that lets you send this Magic Packet, and it’s my current favorite thanks to its simple interface, ease of use, and low price. 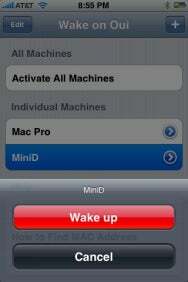 Rise and Shine: Use this screen to configure Wake on Oui for a computer. To configure Wake on Oui for your computer, tap the Add (+) button on the main screen. Enter a recognizable name for the computer, and then fill in the MAC Address field with that computer’s Ethernet MAC address. (On Macs, you can find this information by opening the Network pane of System Preferences, selecting the Ethernet entry, and then viewing the Ethernet tab of Advanced settings; the MAC address is the Ethernet ID.) Although the computer you’re waking must be connected to the network via Ethernet, the device sending the Magic Packet—in this case, your iPhone or iPod touch—can be connected wirelessly. If you’re using Wake on Oui on a local network—for example, to wake your home Mac from elsewhere in your house, or to wake your office Mac from the conference room—you can leave the Hostname:Port field blank. You use this field only if you're trying to wake a Mac over the Internet or across a large network with multiple routers or domains (in which case you’ll also likely need to set up port forwarding on the remote computer’s router, but that’s a topic for another article). Wake-Up Call: Press the red button, and Wake on Oui rouses your Mac from its slumber. Once you’ve saved your settings, Wake on Oui’s main screen shows your configured computers; tap one and then tap Wake Up to send the Magic Packet and wake up the computer. Alternatively, you can tap on Activate All Machines to wake up all configured computers at once. It’s that simple, and in my testing on a local network, Wake on Oui worked perfectly. Wake on Oui also provides onscreen instructions for setting up Wake On LAN functionality on your computer and for finding your Ethernet card’s MAC address. The instructions are brief, but helpful. My biggest beef with Wake on Oui is admittedly a nit-pick: when entering a MAC address, the app requires you to manually insert a colon after every two characters. Given that MAC addresses always include a colon after every two characters, adding the colon automatically—or otherwise letting you enter characters without worrying about colons—would make setup easier. Also, if you regularly wake a particular computer over both a local network and the Internet, Wake on Oui requires you to set up that computer twice—once for local connections, and a second time for Internet connections. It would be more convenient if you could enter both local and Internet settings for each computer on a single screen; when you try to wake a computer, Wake on Oui could choose the correct settings based on your network, or simply ask you to choose Local or Internet. There are also a couple features I’d like to see. The first is Bonjour browsing to automatically locate computers on the local network for easier adding. Second, I’d like to see a feature to automatically ping your configured computers to see which are currently asleep and which are already awake (although, admittedly, many routers and firewalls block ping requests, making such a feature less useful than it could be). But these are minor beefs that are more likely to bother network admins than typical iPhone users trying to sync an app with their Mac. If you wish you could wake up your Mac from across the house or office, Wake On Oui is only a buck, does what it claims, and is simple to use. Wake on Oui is compatible with any iPhone or iPod touch running the iPhone 2.2.1 software update.